By creating an ‘audio encyclopedia of the greatest minds in nuclear energy,’ Bret Kugelmass is on mission to communicate the unique complexities and benefits of nuclear technology to a tech savvy and environmentally concerned audience. “I’m trying to open up nuclear energy to a broader audience,” Kugelmass says. Kugelmass, who holds a masters’ degree in mechanical engineering from Stanford, is former robotics entrepreneur and inventor of the internet-connected drone, turned climate-change thought-leader. Worried about impacts of carbon dioxide emissions, he became a self-educated nuclear advocate. But he identified both a severe disconnect and steep learning curve between nuclear and tech-adjacent communities as impediments to innovation, financing and social acceptance. 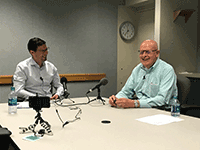 So, he launched a podcast called Titans of Nuclear aimed at bridging that gap through providing information from conversations with experts in that field — which led him to visit Pacific Northwest National Laboratory. Kugelmass interviews with PNNL nuclear experts included discussing their personal career paths, technology expertise, R&D involvement, and thoughts on what needs to be done to move the industry forward. Steve Unwin manages PNNL’s nuclear market sector and is a nuclear project risk advisor. His technical research focuses on the development and application of risk management methods in nuclear power. Steve’s segment focuses on risk assessment, including the industry’s transition to using a risk-informed approach in design, plus the R&D that PNNL performs across the nuclear fuel cycle—from extracting uranium from seawater to improving technologies for the storage and disposal of spent fuel. Also, whether the Golden Age of Nuclear will happen. Tara O’Neil, with her background in environmental compliance, manages PNNL’s work with the Nuclear Regulatory Commission. Tara discusses the environmental assessments and permitting processes, licenses and renewals involved in nuclear plants and whether there is a second Nuclear Renaissance emerging. Brady Hanson, who got his start as a chemical engineer, is a spent nuclear fuel expert. Brady explains nuclear fuel reprocessing, dry storage of spent fuel, and how oxidizing spent fuel compares nuclear to other forms of energy in terms of safety. Ron Omberg, is a fast reactor expert who provided technical advice to the Japanese Government following the 2011 earthquake and resulting tsunami that devastated the Fukushima Daiichi Power Plant. Ron’s interview focuses on the advantages of a fast reactors, provides a definition of ‘breeding,” and he muses on the best way to embark on designing new nuclear technology. Chad Painter, a reactor technologies specialist, was interviewed in Washington, D.C., where he’s on assignment as a National Nuclear Security Administration advisor. Chad discussed submarine reactors, boiling water and light water reactors, and how nuclear technology can reduce energy poverty. The podcaster also toured several nuclear research facilities at PNNL, including the Radiochemical Processing Laboratory (a Hazard Category II non-reactor facility), the Materials Science & Technology Laboratory for high-performance energy materials research, the 318 Building for dosimetry and non-destructive analysis, and the Wasteform Development Laboratory in the Applied Processing and Engineering Laboratory. Kugelmass took advantage of his trip to the Tri-Cities, Wash., to interview another Titans of Nuclear: Bill Stokes, president of Columbia Basin Consulting Group (CBCG), a technical services group specializing in U.S. commercial nuclear energy. PNNL is a partner in pursuing CBCG’s lead-bismuth cooled fast reactor concept. With a podcast called Titans of Nuclear, while in Richland it was obligatory for Kugelmass to visit the Atomic Ale Brewpub and Eatery, home of the plutonium porter and half-life hefeweizen—finishing a day full of nuclear energy interviews with ‘reactor core’ pizza for dinner. For more information about PNNL’s research capabilities—including reactors, licensing, materials, and spent fuel—visit nuclearenergy.pnnl.gov.